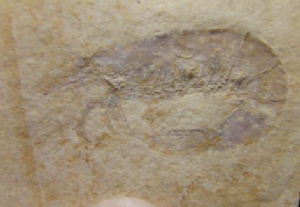 Rectangular piece of lithographic limestone showing a well-preserved complete shrimp. Blygia is one of the rarer crustaceans found in the Solnhofen beds. Lovely detail under magnification.